SUPER PILOT is proud of its 20 years of experience specializing in the manufacture of BNC, MINI BNC, MICRO BNC, TNC, N, UHF, MINI UHF, F, PAL, RCA, SOLDERLESS, FME, SMA, SMB, SSMB, SMZ(BT43), MCX, MMCX, 1.6/5.6, 1.0/2.3 Coaxial series, cable assemblies, Antenna, and etc. With our professional experience as a connector’s manufacturer, our experienced engineers, strict QC, advanced equipments and excellent service are the keys to keep our business growing all along. SUPER PILOT has a fundamental goal: the continuous efforts to upgrade of our quality levels. In terms of development, plans to introduce more new items, and strong R&D team and production line to be good partner of ODM/OEM customers. Any of your inquiries will be processed by well-training sales in a timely manner. We thank you for taking time to view our products and looking forward to having the chance of cooperation! 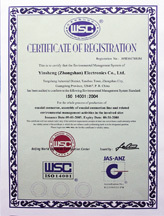 In response to the international mainstream of nowadays, environmental protection and the purpose for improved ecology, our company has implemented ISO14001, 2004, RoHS & REACH. We aim for the policy of "Protect Environment, Prevent Pollution" to achieve the objective of purified, ideal universe.